Vietnam Visa On Arrival: Don’t Get It! Vietnam Immigration Shakedown: The Vietnam E-Visa Error Scam! There are several ways to get a Vietnam Visa. You can get the Vietnam VOA (Visa On Arrival), the Vietnam E-Visa or you can overpay for a Vietnam Visa service marketing itself as the official Vietnam Visa. The visa cost should ONLY be $25 USD after all fees and take 5 days to get. If you’re country isn’t listed above, you will have to get a Visa to enter Vietnam. Luckily, there are 80 countries that can apply for a Vietnam E-Visa online for only $25USD. If you’re country is not E-Visa eligible, you’ll have to apply at your local Vietnam embassy/consulate. If you’re looking for some insight from the EU side in German, check out this German Vietnam Visa Guide. Fill In Your Information Carefully. Please see read the Immigration Shakedown Scam below. After filling out the information on the website, you’ll get an email for a $25 payment. Pay that with a credit card. I wouldn’t trust any website with a debit card. Print out your visa and bring it with you to Immigration in Vietnam. The first time I went to Vietnam I thought the Vietnam Visa for US Citizens was the Vietnam Visa On Arrival! It cost me around $60USD and I went through a third party vendor (I thought it was the official site). When I landed in Ho Chi Minh City to get my VOA I had to wait for 2 hours at the airport to process my Vietnam visa! I couldn’t relax either, it was hot and loud in the airport and they didn’t give me a number. They just called peoples names by yelling them. Now let me tell you, I don’t know what my name sounds like when misread with a heavy Vietnamese accent. So I had to stay alert for 2 hours jumping up at anything that sounded like my name. Be sure to have a printed copy of your Vietnam EVisa and a digital copy on your phone. When you fill out the date of birth on the official e-Visa application, you can’t but the date of birth wrong because you select it on a calendar. Along with my friend, there were several other tourists being hassled at the airport regarding their visa. This was at 1am in Ho Chi Minh airport. Tourists were being charged various visa fees from $20-$200USD depending on how the agents felt. My friend was being charged $150USD. He noticed a German tourist being charged $200USD. Jin stayed strong and refused to pay along with the German tourist. The immigration agent threatened to send him back to South Korea and Jin agreed to leave Vietnam avoid the shakedown. Bluff called. The immigration officer scammer will try to pull this move later at night when there’s less people coming through the airport and target tourists. This is an outrageous price for a “fake typo”. 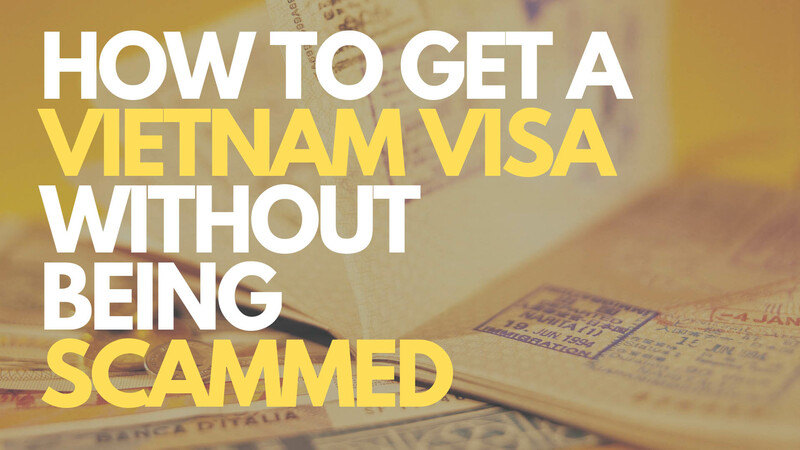 The immigration agent will say your passport doesn’t match your Vietnam e-Visa. He will hang on to your print out and not show you the mistake. In this situation, he said the date of birth was wrong. You will not have cell phone data on your phone when you arrive in Vietnam…even with Google Fi or Verizon. The scammer will offer to expedite a new Visa for a price. $150 USD in this situation. If you have a digital copy of your visa, you can confirm if there was an issue filling it out. Reason with the immigration officer and tell him you know there’s no mistake. You can get his name and try to report him or leave a bad review on Google Maps for the airport with the officer’s name. To confirm digitally, you can log in to see your e-visa Vietnam application online by logging in to the airport free wi-fi. If you did make a mistake on your visa, you can wait at the airport until morning and confirm your visa with different immigration agents. They may be more lenient. SGN Airport (Ho Chi Minh) closes at 3:30am. The immigration agents were just about to end their shift since the airport closes. They negotiated with Jin and German tourist again and brought the “new visa” fee down to $75USD. They both agreed and were on their way out of the airport. This is definitely a bad way to start a vacation. I probably would have called the immigration agent a liar and waited it out. That or try negotiating a lower bribe. Depends on the situation. But if you’re still looking to have a great vacation, my other post lists tips on how to book the ultimate vacation. Have you been scammed while traveling like this? If so what did you do and was there any justice?